Crispy macaroon shells filled with a tonka bean pastry cream, set with white chocolate. Delicate macaroon shells made with beaten egg whites, ground almonds and icing sugar filled with a rich and creamy ganache of milk chocolate, coconut milk and Malibu. Delicate macaroons filled with a fresh and zest lime and ginger buttercream. An alternative way of serving macaroons - a savoury recipe of foie gras macaroons served with port. 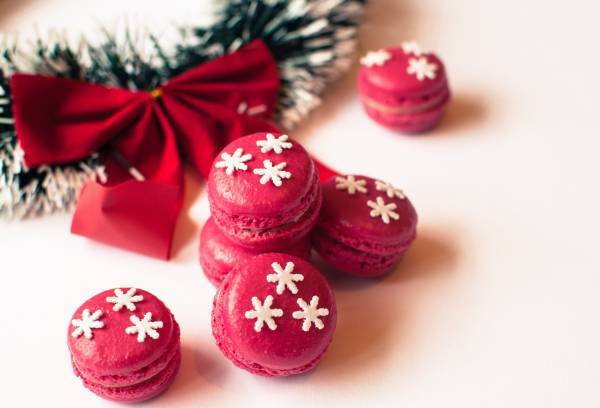 A dainty pink macaroon filled with raspberry and rose water cream. 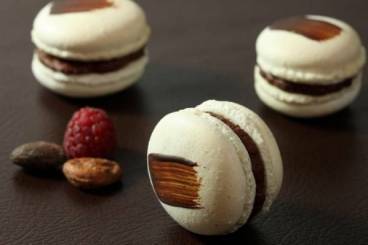 Delicate French macaroons filled with a creamy mango mousse and fresh raspberries. Delicate French patisseries filled with a lime, vanilla and gin cream.